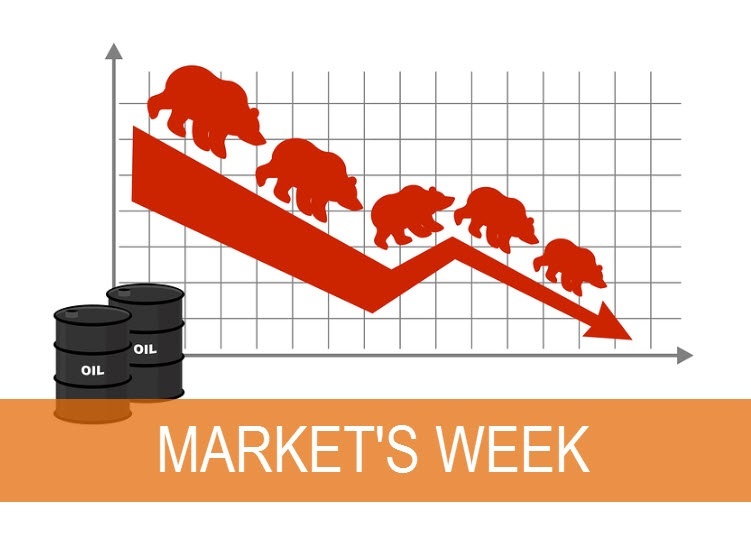 Oil enters bear market after dropping from early October peak. Since October 3, WTI crude oil has declined as much as -27%1 given a number of headwinds including weaker demand, increased supply from key producers, expectations for higher U.S. supply and a strong U.S. dollar. Implications for the U.S. economy are somewhat mixed as lower gas prices will benefit U.S. consumers, but the growing energy industry will face headwinds. Looking at the broader financial markets, global equities declined -1.2%2 last week. A gain in emerging market equities (1.0%)3 was not enough to offset losses in the U.S. (-1.5%)4 and non-U.S. developed markets (-1.6%)5. Fed Chair Powell remains upbeat on U.S. economic outlook. In a public appearance last week, Federal Reserve (Fed) Chair Jerome Powell remained positive on the U.S. economic outlook but acknowledged challenges the U.S. faces in 2019. Powell did not back away from previous hawkish comments implying the Fed planned on a number of additional rate hikes, but the tone of his comments was somewhat less positive than before. He reiterated that every Fed meeting in 2019 will include a press conference, meaning a policy change is possible at any given meeting. In addition, Fed Vice Chair Richard Clarida repeated his view that Fed policy is getting closer to “neutral” – which is different from Powell’s view. Resignations from UK cabinet places Brexit deal in disarray. UK Prime Minister Theresa May vowed to push forward with her Brexit deal despite some in the Conservative party calling for her to step down. May’s deal means that the UK would remain economically tied to the European Union. Cabinet members unsupportive of May argued that the current deal gives Brussels excessive power over the UK and that separate regulatory regimes for Northern Ireland and the rest of the UK is unacceptable. A leadership confidence vote on May could happen, but a lack of clear alternatives might help her resist the challenge. A “no-deal” Brexit is still not widely expected, though May being removed from her position would add more uncertainty. No major surprises in U.S. and Europe inflation. U.S. Consumer Price Index (CPI) figures were close to expectations, with CPI coming in at 2.5% year-over-year (y/y) and CPI Core ticking down from the prior reading to 2.1% y/y. In Europe, both headline and core inflation matched consensus expectations at 2.2% y/y and 1.1% y/y, respectively. Strong earnings growth still failing to calm equity markets. 93% of S&P 500 companies have released third quarter earnings results. Aggregate earnings growth (26.3% y/y) and revenue growth (8.0% y/y) remain ahead of expectations6. Additional softening outside the U.S. expected in PMI data. Japan, Germany, Europe, and the U.S. report flash manufacturing Purchasing Managers’ Index (PMI) figures on Friday with surveys showing relatively little expected change in Germany and Europe at 52.2 and 52.0, respectively. Germany began the year at the historic high of 63.3 before gradually decreasing to 52.2 in October. Europe’s reading also decreased from a highest level of 60.6 to 52.0. The U.S. has gradually increased since July and is expected to move up to 55.8 this month. It remains the only country with a higher current reading than its 2018 starting point. Japan has no consensus figure but it has steadily climbed higher since May. All regions are expected to remain comfortably in expansionary territory (above 50). 2) Bloomberg, MSCI World Index return 12Nov2018 – 16Nov2018. 3) Bloomberg, MSCI Emerging Market Equities Index return 12Nov2018 – 16Nov2018. 4) Bloomberg, MSCI U.S. Equities IMI Index return 12Nov2018 – 16Nov2018. 5) Bloomberg, MSCI ex-U.S. Equities IMI Index return 12Nov2018 – 16Nov2018.